What can you do when you find solder mask covering some part of a circuit board where you don't want it. It's certainly not unusual to find test points, ground pads, or even a component footprint inadvertently covered with solder mask. But, all is not lost! There are several safe and reliable ways to remove solder mask from the circuit board surface. Grinding and scraping, milling, micro blasting, and chemical stripping are the most common. They all have advantages and disadvantages and we'll review them in this feature. Several factors will help determine what method will be used to remove the coating. What type of solder mask is it? Where is the mask located on the circuit board surface? How large is the area of the mask that needs to be removed? Are the circuit boards assembled or bare? These factors and others must be evaluated before deciding on the most appropriate removal technique. Image 1: Basic hand grinding. Nothing fancy here, just lots of grunting and groaning. Often the use of a knife, scraper or pick in the hands of a skilled technician is the most controlled technique for removing solder mask from areas where you don't want it. No special setup is needed but operator fatigue can be a drawback on large projects. Mechanical erasers, like the type a draftsman would use, can speed up the process. This technique is controlled and methodical, most commonly used when removing a thin layer of solder mask. 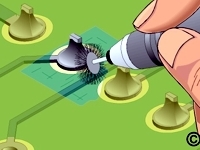 It can be used in conjunction with other removal techniques as a final surface preparation step. Image 2: Milling machines can deliver the accuracy needed for precise solder mask removal. Would you use a milling machine to remove soldermask? Seems extreme, but can be a very effective and precise technique for removing solder mask. Since sharp cutters will be used, precision depth control is essential. The milling system will need to be fitted with a microscope for visual aid. Carbide end mills are the most common type of cutter used. Since carbide cutters are so sharp they will tend to pull into the coating and may penetrate into the board surface. Turning the cutter in the opposite direction can be an effective technique for controlling the depth. Operator skill and experience are paramount. Chemical Stripping This technique is most effective when removing solder mask from copper planes or soldered surfaces. Masking tapes or other protective materials should be placed on the circuit board surface to isolate the area to be stripped. The chemical stripper is then applied with a brush or swab. Since the stripper is liquid, it is often difficult to control. The chemical will attack the coating and break it down just like a paint stripper. The most common chemical strippers will contain methlyene chloride, a strong solvent. Not only will methlyene chloride based strippers quickly remove the solder mask, they'll deteriorate the base material if exposed to it for a prolonged period. For this reason chemical strippers should be used with great care and only when alternatives prove too costly or time consuming. Image 3: Microblasting systems can be used effectively for coating removal. This is an excellent technique for removing solder masks from large areas of the circuit board surface. Small bench top systems designed specifically for coating removal are available from several sources. An abrasive material is propelled through a pencil shaped hand-piece. The abrasive material simply blasts away the coating. This process creates substantial friction, and static charges, in the process. When working on circuit boards containing static sensitive devices, the microblasting system must be designed to eliminate potential ESD damage. Significant preparation time including masking is often needed to control the areas to be removed. A thorough cleaning will be required to flush away any blasting material from the circuit board. Operator skill and training are essential if you expect to obtain a reliable outcome.